Well, in my attempt to really start making a living out of this one day...I am two pieces in on my latest writing decision to start contributing to LAist. Whatever, I may not get paid but at least I'll get more exposure than I do by just writing for myself here. It's also pretty awesome because they let me do this! 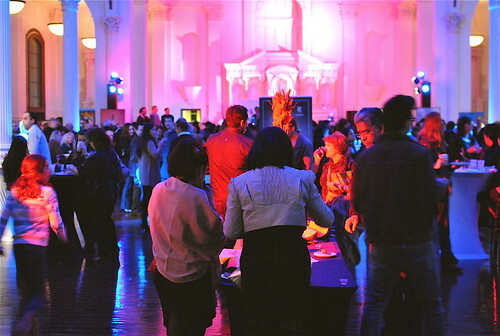 It was a full church as more than 1,000 tortilla-loving Angelenos gathered at St. Vibiana's Cathedral last Saturday night. 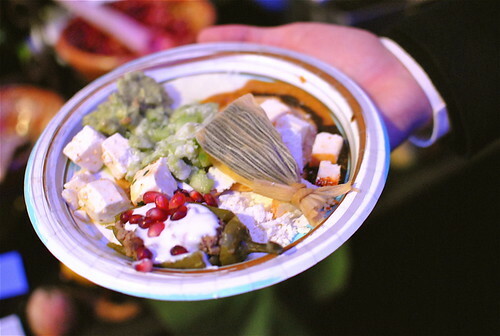 They were there not to eat a communion wafer but instead to celebrate 200 Years Of Mexican Cuisine, a tasting event put together by The Taste Of Mexico Association benefiting Heal The Bay Foundation. Just in time, as this year marked the bicentennial celebration of Mexican Independence…not to mention "Traditional Mexican Cuisine” making it to the list of UNESCO’s "Intangible World Heritage." 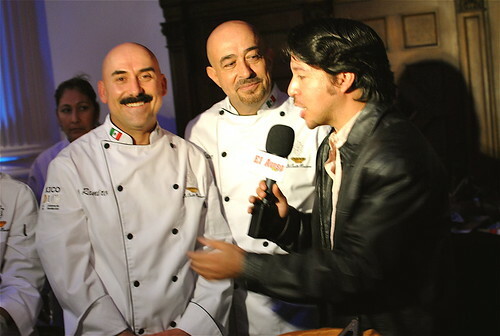 The Taste Of Mexico Association was formed earlier this year by the co-owner of La Monarca Bakery, Ricardo Cervantes. The spicy organization is made up of L.A's top Mexican powers: La Casita Mexicana, Guelaguetza, Frida and course, La Monarca Bakery. "We have all known each other since we're in the same industry and have worked together on occasion before" says Cervantes, when asked about how the organization was born. "We simply want to promote and redeem authentic Mexican food." The line to get in to the church party was an hour long and the lines to get food snaked all the way around the altar. "I'm very happy with the turnout, I think it was a great success” says Jaime of La Casita Mexicana. Despite the lengthy waits, people weren't really complaining once they finally got their regional Mexican nibbles. 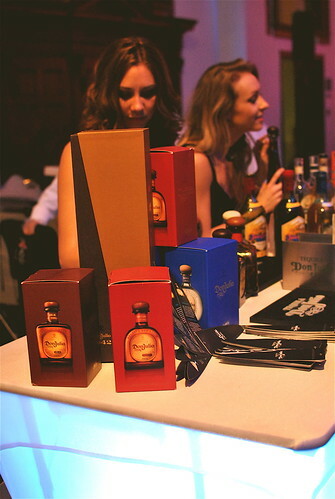 Although, I'm pretty sure the copious amount of line-less booze booths touting Tequila girls and unlimited pours had something to do with that too. As always, La Casita Mexicana stole the show with masterful renditions of unique regional eats. Their table bared no free space in the least. It was stacked with 7 assorted Mexican cheeses that ranged from crumbly, aged Cotija Adobada to a milky, oil-brined Panela and a kaleidoscope-like selection of elusive Salsas. 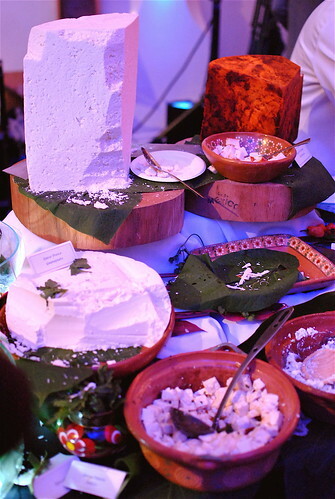 My favorite was the milky Salsa Blanca from Colima, made from chiles gueros and emulsified with olive oil. 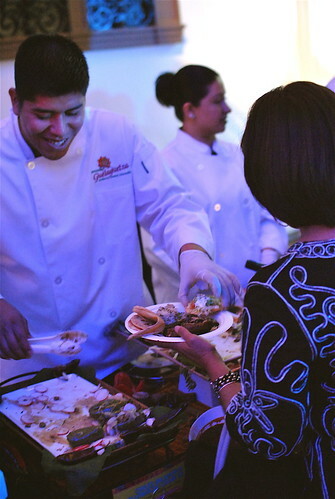 Aside from the queso and salsa fest, their paper plates were overflowing with 2 different types of Ceviche, Tamales de Huitlacoche and their Signature sweet Chile en Nogada. But they weren't the only ones that came prepared; Fernando Lopez Sr. (owner of Guelaguetza) brought out the big tostadas as well, about a thousand of them to be exact. I can still taste the one topped with a crunchy fry-up of chapulines and still craving seconds of the one topped with Tortitas de Camaron (shrimp fritters) in Mole Coloradito. Aside from the food and booze that flowed until the very end, the altar that day doubled as a colorful stage for Mariachi and traditional folkloric dancers. "We were very happy with the turnout" says Ramiro Arvizu of La Casita Mexicana. The organization is already thinking of ways to better the event for next year and even hosting other Mexican Holiday events in the near future. They are also willing to add other restaurants to the lineup.